Vigor2925 Series is the IPv6 ready Dual Gigabit Ethernet WANs and Dual USB WANs broadband security firewall router. The product range is from Vigor2925, Vigor2925n, Vigor2925n-Plus, Vigor2925Vn-Plus and Vigor2925ac. The Dray Tek Vigor2925ac ensures the business continuity for today and the future IPv6 network. Its two gigabit Ethernet WAN ports can accept various high-speed Ethernet-based WAN links via FTTx/xDSL/Cable. The 2 USB ports are for 3.5G/4G LTE mobile broadband access. 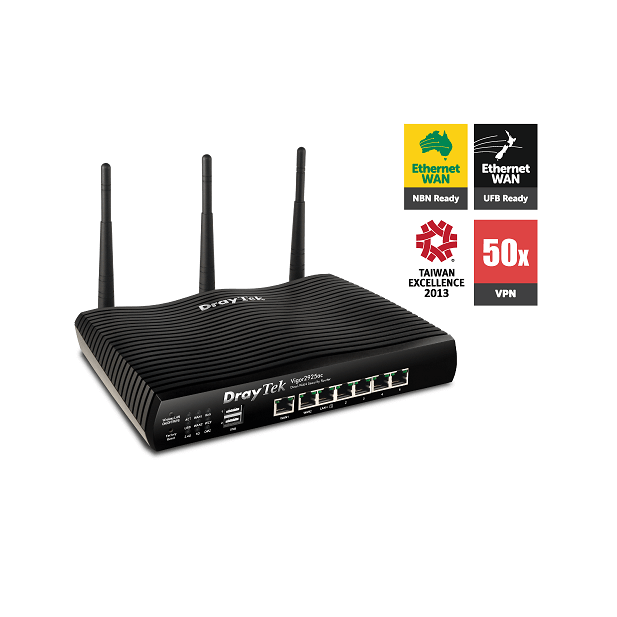 With the multi-WAN accesses, Vigor2925 series routers provides flexible and reliable broadband connectivity for the small business office. The VPN backup and VPN load balancing assures business continuity via multi-WAN connection to the Internet. The bandwidth management, Quality of Service, VLAN for flexible workgroup management, User Management for authentication, Route Policy, Central VPN Management, Central AP Management and Firewall serve your daily office network to bring in more business opportunities. The firmware version 3.8.0 will allow Multi WAN/ Multi LAN to support IPv6 in order to let network administrator easily set up more IP-based applications. The Vigor2925ac is equipped IEEE 802.11ac wireless access point which can run 300Mbps @ 2.4GHz and 1300Mbps @5GHz 11ac).